Ferrets are notoriously picky eaters, and they need food that is packed with high-energy, meat-based nutrients. Weaning is a key moment in determining what a ferret will consider edible, so it's important to ensure that the food your little ferret kit gets from the beginning will provide a correct diet for a long and healthy life. As with any pet, it's important that you make diet transitions gradually, and monitor your ferret for changes in appetite and behavior. Ferret kits are typically weaned at 6 weeks, and you can offer a baby ferret hard kibble immediately at weaning. For a better transition, soften the kibble with a small amount of water. You can put the moistened kibble in the refrigerator for a brief time to let it soften before you offer it to your little pal. If he's a picky eater, consider adding a small amount of kitten milk replacer to the kibble. Gradually reduce softening of the kibble over the next two months, until you are feeding solely dry kibble. Numerous commercial ferret foods are available for you to choose among. If you find the choices overwhelming, keep in mind that ferrets, which are domesticated predators in the weasel family, are obligate carnivores. That means they must get their nutrients only from the flesh and organs of other animals, and not from vegetable matter. Ferrets need high-protein, low-carbohydrate foods. Read the ingredients lists on the labels. You want to find meat-based protein sources such as “chicken” or “chicken by-product" as the top listed ingredients. Ferrets do not digest fiber, and excess plant-based protein can lead to health complications, including metabolic issues. Excess carbohydrates also cause health problems. While cats also are obligate carnivores, their needs are somewhat different than those of ferrets. Premium cat foods, such as those sold exclusively through pet specialty stores or by veterinarians, are also nutritionally adequate for ferrets, but other cat foods cannot serve as ferret foods. Ferrets need most of their calories to come from fat, which not all cat foods offer in high enough quantities. You should offer all or most of your ferret's diet as hard kibble, which is balanced for their needs; ferrets cannot consume enough canned food to meet their needs. Some advocates believe feeding raw foods or only meat is best for the health of a ferret, because such a diet most closely resembles what ferrets would eat in the wild: foods low in carbohydrates and high in protein. However, raw foods pose inherent health risks for both ferrets and humans, including Salmonella and E. coli infection. 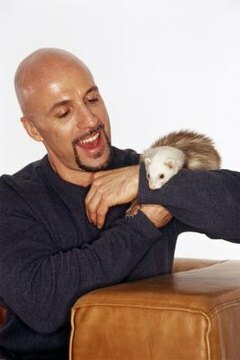 If you feed only meat, your little ferret will not get all of the nutrients he needs. These nutrients come from sources such as liver and bone. For your ferret's health, it's important to feed a more complete, commercially prepared diet. Your veterinarian can help you choose the proper diet for your little pal at weaning and as he matures. It's important to minimize snacks and “human food.” Such extras will unbalance your pal's diet. Many snacks are higher in carbohydrates than is good for your ferret. Frequent, small, balanced meals are essential to his health. Feed your buddy in a ceramic or stainless steel bowl, and wash it after each feeding to prevent the buildup of germs. If you have more than one ferret, provide multiple food bowls and place small amounts of food in each. Offer small amounts of food every few hours, and keep track of how much your ferret is eating. Ferrets often kick food out of their bowls. If you leave room in their bowls for this, you will have less mess to clean up. Ferrets often try to hide excess food to consume later. If you are finding food stored in hiding places, reduce the amount you're offering at each meal. Why Do Ferrets Need Taurine?